There is a local bus service in Qatar. It is only a fairly recent transport innovation. Construction has begun on a city-wide metro as part of transport improvements in the build-up to the World Cup in 2022. Doha is a hot country and waiting for a bus in the blazing heat of summer would not be pleasant. 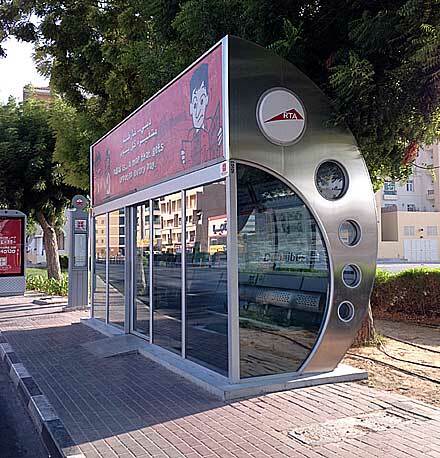 The solution in Dubai is the air-conditioned bus shelter. I didn’t get a bus, but cooled down for five minutes inside. Clean, tidy, not smelly and a good temperature, quite unlike a railway waiting room in the UK. Don’t you miss the aroma of stale urine and spilt beer? What about the amusing graffiti? No place like home! !